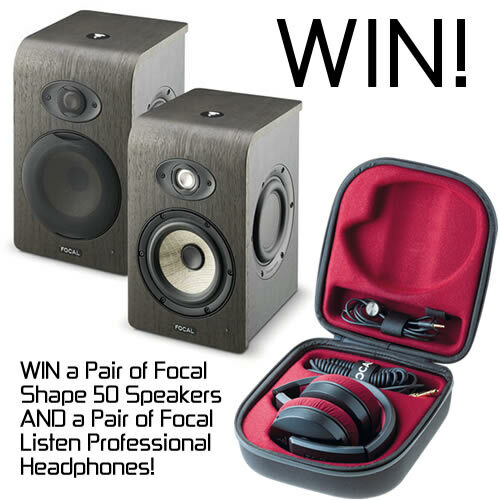 WIN a Pair of Focal Shape 50 Speakers AND a Pair of Focal Listen Professional Headphones! The ULTIMATE Studio Set! Our friends at ADSR Sounds & Focal are offering one lucky ADSR reader the chance to win a pair of Shape 50 monitors PLUS a pair of Focal Listen Professional Headphones. Gain total control of your work with unbelievable precision and definition.These are must-have tools for any home or professional music production set up. Designed to meet the needs of nearfield monitoring, Shape monitors combine an ingenuous design and numerous settings optimised for the acoustics of small listening rooms. The tonal balance and the capacity to reproduce the entire audio spectrum with acute precision make Listen Professional circum-aural closed back headphones the essential ally for monitoring transfer quality.